A new update was released for the AMD Gaming Evolved client that includes some great new functionality. First up is a redesigned UI, next is a new beta for Game DVR. 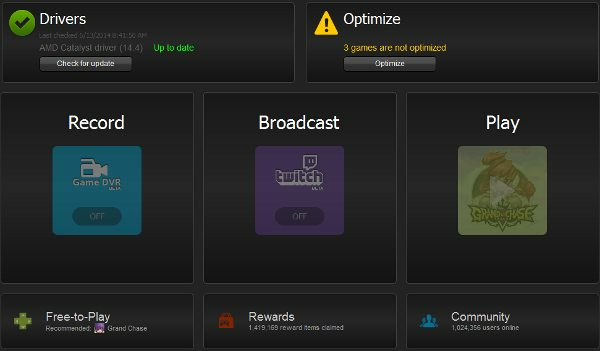 This feature is similar to Nvidia's Shadowplay functionality that allows you to manually record gameplay footage with minimal impact. Or, you can instantly save the previous 10 minutes of gameplay if you missed something great by not manually recording. Hm. Apparently this client is essentially just a Raptr client with a different name? Some are suggesting that this tech will be usable by both AMD and Nvidia card owners and may be rolled into the Raptr client a short time down the line. It probably has a higher performance impact than nVidia's version seeing as how nVidia utilizes hardware to accomplish its task.